Well, it's official. I have now caught two colds this summer. Prior to June I can't remember the last time I had one. Right now I look like first pick to lead Santa's sleigh. Needless to say it's been a rough week. I'm so ready for this weekend, which will most likely be my last free one until December. Since I've pretty much been out of commission this week, today we're pulling one from the archives, a delicious, summery red sangria. 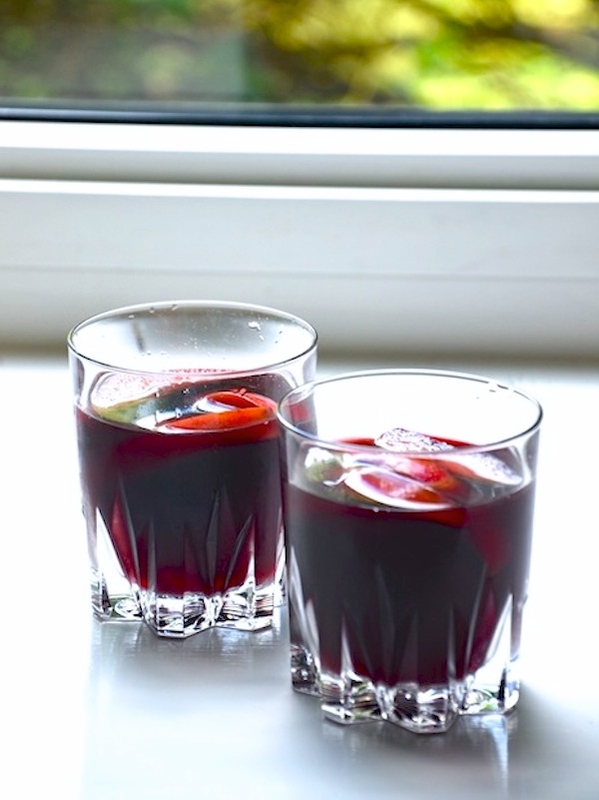 There are a lot of recipes for sangria out there, JD and I have made it several times over the years and this one remains our favorite. Pour the red wine, gin, and ginger ale into a large pitcher or container. Stir in sugar until dissolved. Slice apples, nectarines, and grapes and add to mixture. I recommend letting it chill overnight to let the flavors blend together, but you can serve it right away over ice if you like. Note, this recipe makes a lot of sangria. You may be drinking it for weeks following, but I can confirm that it keeps well. We bought a plastic container with a spigot and kept it in the fridge for a couple of weeks until it was gone. Thank you so much for reading and have a wonderful weekend! For some reason I've always been intimidated by the idea of making sangria, even though I know it's super easy. This looks amazing- cheers! This sounds delicious! I look forward to your weekly posts about delicious drinks :) Feel better!!! Sounds yummy and just in time for the beautiful wknd we're supposed to have. Thanks for sharing. Um BOMB! I hope you feel better and happy weekend! Such a bummer about the cold, but well done as Santa's first pick!! Oh no - so sorry to hear you aren't feeling well! Summer colds are the worst!! This recipe looks amazing!! Thanks for sharing - hopefully I'll be cheersing soon! Yum! Looks delicious! Hope you are feeling better soon!! NO! That sounds awful :( My boyfriend was sick last week and he was like, sick, IN SUMMER?! I know I know, I think it can just be hard to avoid sometimes! Sorry to hear that, but on the upside, this LOOKS DELICIOUS! Sorry to hear that you don't feel well. Gee! the second already, that's pretty nasty. Here's hope for a speedy recovery honey. Hope you're feeling better soon! Lovely blog here btw! Would you like to follow each other on GFC? Please let me know on my blog so I can follow back. Thank you. I hope you feel better !!! Those sangrias look delish !! that sangria looks so good especially in this heat! But feel better soon!! This sounds way too yummy. Good things it's Friday. Perfect excuse to try it!! Definitely trying this out. Now I have to buy the wine first, though. :D It's so pretty, by the way, your shots. Looks so good! Especially in this heat. I hope you feel better, we've been sick to and it's the worst. It seems so out of character to be sick in the summer, and I am simply not a fan! Oh em gee! So trying this!! I hope you feel better!! Drink lots of green tea and add turmeric to everything (those anti-inflammatories really help)! LOVE sangria!! I hope that you get to feeling better! I think I have a cold coming on right now...nooooo! Oo what a yummy drink! I need to try this! Looks yummy =). Check out my blog for the latest in eyewear trends. Wish I am good at making drinks, but I am just very good at drinking and lounging! This looks so good….I will definitely try it out <3 Thank you!!! have to try this out ! looks super yummy !! This looks so delicious! Thanks so much for the recipe I will have to make it this weekend! I am so sorry you are not feeling very well! Take care of yourself and get lots of rest! Wonderful drink!! Really love it!! I love Sangria, this one looks good too! I hope you feel better! Being sick in the summer (or any time) is never fun. This look delicious! Nothing like a good sangris, can't wait to try this recipe!!!! !